Many of you will have seen that our new pitch is now completed as will shortly be the adjacent Council pitch. Both surfaces are sand dressed carpets manufactured by Lano in Belgium. The club’s is the Lano Revolution; the Council’s the Lano Integration the difference being that ours is designed specifically for hockey. The Council’s design recognises that football will be played on it as well as hockey. Both pitches are certified by the FIH as suitable for playing all national league games and up to junior international. You should not notice any difference whichever pitch you play on. You will notice that there is still some sand on the surface, but this will settle down into the base of the carpet over time and be largely invisible. In addition to the new carpet, we have renovated the dugouts, created a fenced-off warm up area at the far end of the hardstanding area using some of the old carpet and put a drinking water supply into the tea hut. We are also replacing damaged perimeter and spectator fencing. Some of the old carpet is additionally being used to minimise the extent to which dirt is walked onto the pitch. Keyholders will also notice there are 2 padlocks on the main gate. This is to prevent people climbing over the gates onto the pitch. Both padlocks use the existing gate key. Please make sure that you, and opposition players, use the right footwear: dimpled trainers/boots for designed for hockey. Flat shoes should be avoided as they are considered to be more aggressive on the pile of sand‐dressed systems. We don’t expect children younger than year 7 to have hockey astros but we would like all children from year 7 and above to wear astros rather than flat soled trainers. All adults should wear hockey astros. However any back2hockey adult players not yet playing games can wear flat soled trainers. Studded/bladed football boots are forbidden. 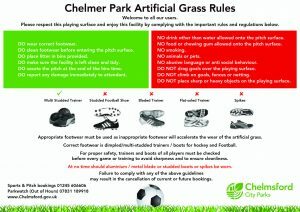 Please also ensure that you walk to the pitches by the footpaths and not across the grass. Encourage our visitors to do the same. You may be aware that our use of the council’s old pitch has been under a very beneficial financial arrangement which dates back to the capital contribution made by the club to the original pitch installed in 1989. Under this arrangement we had 14 hours a week free use of the pitch between September and the end of March. This arrangement has now ended and the club now has to pay for using the council’s pitch at a cost in excess of £10000 pa. The club has been able to reduce the cost by block booking its pitch requirements thus saving the payment off 20% VAT. But all additional bookings will be at full cost – £70 per hour. For this reason, we ask members not to ask for an additional booking unless they are absolutely certain it is needed. We will also be exercising, as other clubs do currently, the right under league rules to recover pitch costs (on either pitch) where opposition do not fulfil a fixture. Clubs will be informed. You should also be aware, that we will be “self-invoicing” ourselves for the use of our own pitch. This has been factored into our budgeting, but will ensure that we put into our ring-fenced reserves sufficient capital to maintain the pitch in line with its warranty conditions and provide for its replacement in the future.